Quality and plant reliability are key focuses of the nuclear power generation industry. For more than 40 years, we have been a major player in the nuclear industry by providing critical pumping solutions that contribute to safer and more efficient operations. 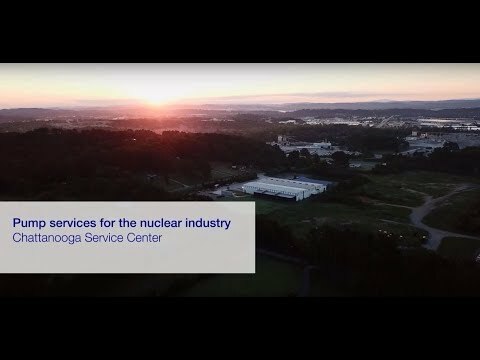 Learn more about our nuclear capabilities and engineering solutions below. There are only few industries that demand more attention to detail than the nuclear sector; with quality and reliability of paramount importance, every operational aspect is critical in delivering state-of-the-art solutions to the nuclear industry. Having supplied roughly 1,000 boiler feed water pumps for various power plants such as conventional, nuclear, biomass, and concentrated solar power plants around the world, Sulzer has the experience and capabilities to advise customers on the appropriate solutions for their challenges on pumping applications. To provide the best possible experience for our partners in the industry, Sulzer nuclear facility features state-of-the-art equipment, highly experienced engineering staff and the expertise to maintain, repair, retrofit and manufacture almost any OEM or third-party pumps. Our Chattanooga Service Center mainly deals with service water pumps, residual heat removal (RHR) pumps as well as auxiliary feed pumps, all of which operate in uncontaminated environments. Sulzer can assume responsibility for the design, reverse engineering and certification of pumps and assemblies for most original equipment manufacturers (OEMs). Using state-of-the-art equipment, such as laser scanners to create 3D drawings of complex impeller geometries, enables project timings to be minimized. At the same time, the quality assurance program employed at the service center is certified and audited to meet the requirements of 10CFR50 Appendix B, part 21, and ASME N and NPT Class 1, 2 and 3.